“Necessity is the mother of invention. Hunger is the father of ingenuity. Whether you're a nomad traveler who spends a lot of time in hotels, OR a budding entrepreneur with limited resources, OR a divorced mid-lifer living in the basement of a generous friend who won't agree to feed you as part of his generosity while you "find yourself," OR just a run-of-the-mill cheapskate looking for ways to make meals using appliances in your hotel room or save on the cost of utility bills and kitchen appliances at home, this book is for you! It may look like just an ordinary coffeepot... but in the hands of the master coffeepot chef you will soon become, it can create.....this! Most any style coffeepot will do...no rewiring, no unscrewing, no dismantling, no disabling anything, ..just a little "why didn't I think of that" ingenuity....and voila! These are all real recipes! Every one of them was actually prepared, eaten and photographed (not necessarily in that order) with an actual coffeepot (I mean, they weren't photographed with a coffeepot, they were photographed with a camera, but cooked with a coffee pot, oh heck, you know what I mean, darnit!! ), just for this book! "Hello, My name is Seth. I have been living on the road for 10 years, touring with ____________ [editor's note: the live production of a popular children's show which shall remain nameless]. I am in hotels 47-50 weeks a year. Most of the time I travel domestically in the USA. but more recently I have been spending about 6 months a year internationally. I have been fixing meals in my room for quite a long time. Currently in Italy I bought a electric Kettle/ coffee pot and some metal lined (because I couldn't find glass) Thermos(es). A vegetarian on my current tour handed me your book. Good read, very nice. My schedule can have me work from sun up to sun down or three days off; I never know what shopping opportunities will or wont be available. 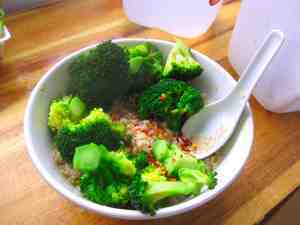 I constantly look for what we call crate foods/ suitcase foods for days when there are no food sources available. Your book has given me some new things to try. "Once such traveler, a vegan by the name of Walt Goodridge, found a solution to all your culinary woes. 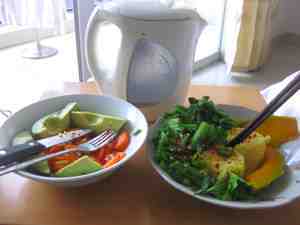 His book, The Coffeepot Cookbook, hurtles you through a unique way of preparing food to your needs while on the road. The concept is quite clever and incredibly simple: buy local ingredients, stick them in your kettle coffeepot (he's gonna hate me for that slip), wait until cooked, serve and then nomnomnomnom. 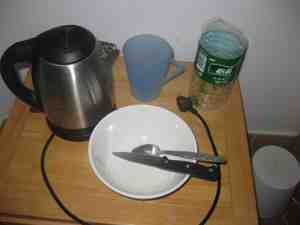 What you don't realise is that the road to coffeepot cooking is fraught with sticky, gooey danger. Fortunately Goodridge had run the gauntlet of trials and errors for you and has come up with some ingenious solutions, as he traveled his way through China. 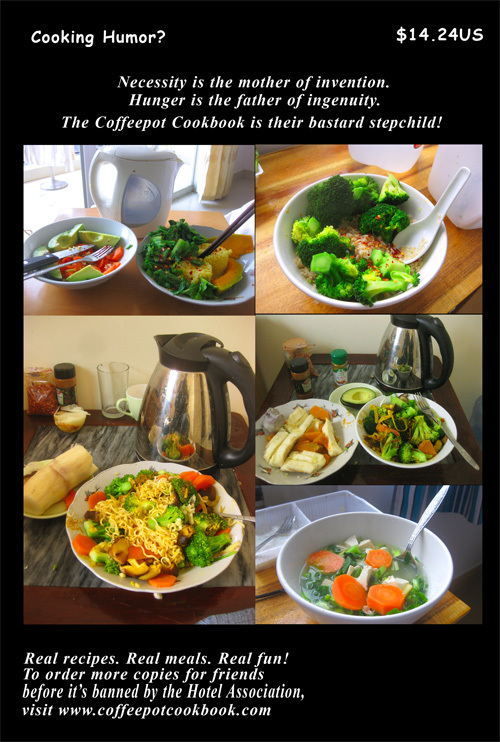 It was surprising to see the variety of food he was able to cook in his coffeepots and his photo's really give you a good insight into this variety. Goodridge writes at a sprint and his hyperactive hilarious style is captivating." --only the good parts of the book review by –Scott Donald, HungryFeet.com Thanks, Scott! did you notice it says "LATTE" show? Perfectly priced and sized for budget and backpack! Ideal for the chronically or situationally cheap. You don't have to be a backpacker, a nomad or a frequent traveler to enjoy saving money on pots, appliances (no more cancer-causing microwaves), or utensils. 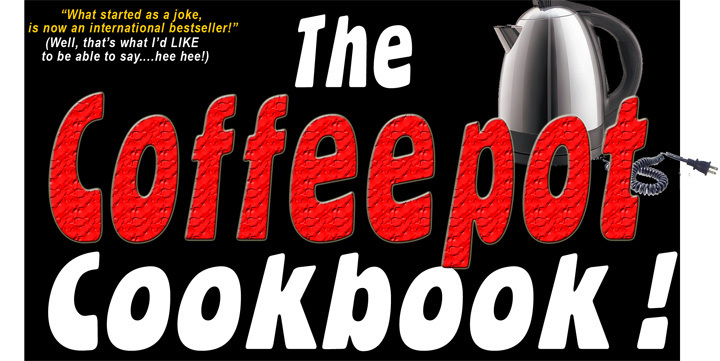 The Coffeepot Cookbook can be used effectively right in your own home, apartment or your section of the trailer park. The perfect "going away to college (finally!)" gift! It's about time! You've been wanting to use that freeloader's room as a home office, a guest room or storage closet. 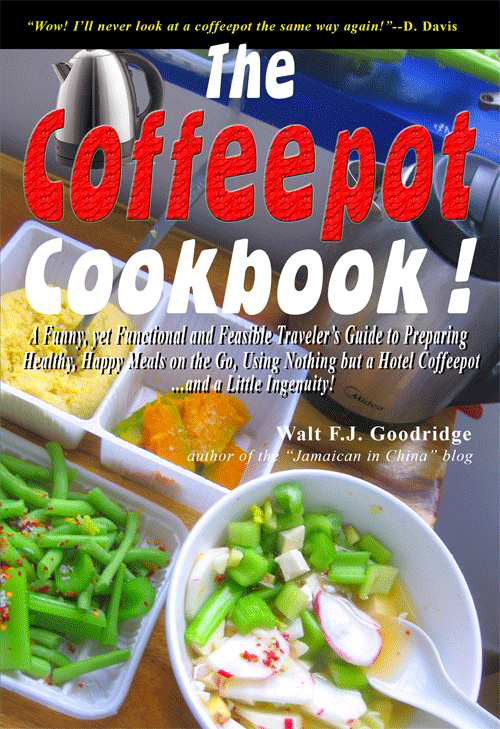 But just so you won't feel guilty for not paying for a meal plan for the kid, give junior something useful for his dorm room: The Coffeepot Cookbook! See? You're not really a bad parent after all. The perfect "time to live on your own (finally!)" gift! It's about time! You've been wanting to use that freeloader's room as a home office, a guest room or storage closet. "Here. Take this book and get out." Think about it. No one is ever going to believe you that a book like this actually exists. But, you'll get the next to last laugh when it shows up delivered to their doorstep. THEY'LL get the last laugh when they read it! The coffeepot makes the man! Display The Coffeepot Cookbook proudly on your living room coffee table the first time you invite her over, so your date knows what sort of experience she's in for with you as a boyfriend. The coffeepot makes the woman! Men invariably set their expectations high when it comes to the women they marry--particularly when it comes to their skill in the kitchen. Can't cook? No problem. 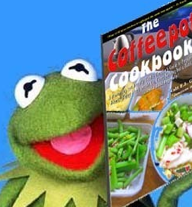 Display The Coffeepot Cookbook proudly on your living room coffee table the first time you invite him over, and let's nip that bad boy in the bud--and lower those expectations--from the get go! Let's face it, you're not going to find this trend-setting book next to your Gideon Bible in the bed and breakfasts, motels and hotels around the world. In fact, once the International Hotel Owners Association gets wind of these coffeepot recipes, chances are they'll move to get it summarily banned in all continents and all languages. Get it now before the book burnings begin! • I Know! I Know! and the total return fees will be $19.265, you will owe us an additional $1.325. Once you start entering your payment information, you'll enjoy seeing technology at work and witness the cool process of making payment by credit card, seeing your card get "approved," getting a confirmation email within 10 seconds with a link that allows you to download an actual book right onto your computer. You'll satisfy your chronic recurring cheapness by reminding yourself that you can ask for a refund any time within 30 days. But once you download or receive the book in the mail, you'll get some enjoyment and even a few laughs out of it. You'll learn things you didn't know before. You'll own something for eternity that you can refer back to again and again. And, who knows, you might even be encouraged to do something similar yourself. After all, you'll hear yourself thinking, "if THIS guy can do this, so can I! Where did I leave my credit card??!!! Wait! Before you order, check this out! Want to make money while you're traveling and coffeepot cooking?